When the children returned after the Christmas holidays they discovered an egg outside! We were very surprised and had great fun exploring different animals that hatch from eggs. We then made some exciting predictions. We decided to adopt the egg and take care of it in our warm classrooms. With lots of love and care from the reception children the egg begun to hatch but one morning we discovered that the egg was missing and our classroom had been trashed!!! 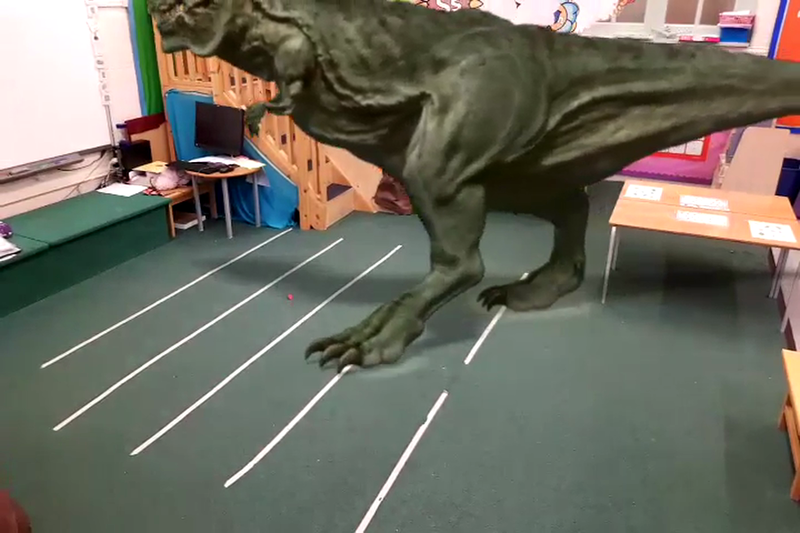 We became investigators and noticed some animal footprints on the floor, we looked at our classroom cameras and found out that a dinosaur had been in our room and it took the egg! For our Marvellous Middle we took part in an amazing dinosaur workshop. We were Palaeontologists for a day and had lots of fun using different tools to dig for dinosaur bones and fossils. We learnt all about some different dinosaurs and how long ago they lived! All children need spare clothes from time to time. Please send in a bag with Spare clothes in it, this can stay in school. Children in Reception need PE kit as well in a separate bag. All children have a home school communication book for you to continue their learning at home. These are sent out every Friday and should be returned to your child’s class teacher on Tuesday. ALL clothes and belongings should have their name on the label e.g lunchboxes, water bottles, jumpers, coats and shoes. All children need a bottle of water for the classroom with your child’s name on it. This should be separate from their lunch drink. Weekly Pound fund: Please could you continue to send in £1.00 each week so we can buy extra things that can make learning exciting.